Many people say that the county of Magnesia ( which also includes the nearby islands of the Sporades ) is amongst the most beautiful in all of Greece. It is a place where the landscape is like no other, and the combination of mountain and sea, of small traditional villages and peaceful coastal resorts, make it a wonderful holiday destination throughout the year. 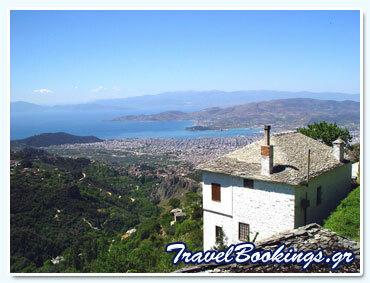 Stretching along the east of Magnesia from the north to the south is the magical Pelion peninsula. Legend tells us that Pelion is the home to the mythical centaurs, as well as being the holiday destination of the Gods. With the blue waters of the Aegean sea on the east, and the Pagasitic Gulf on the west, Pelion is easily one of the most beautiful places in all of Greece. From the soft golden sandy beaches, to the rich green forests and colourful fauna, Pelion is a place that you will instantly fall in love with. Magnesia is a county with a rich and wonderful history, as well as being a very important part of Greece in mythology terms as well. It was from here that Jason set off with the Argonauts in search of the Golden Fleese. Pelion is home to some of the most cleanest and beautiful beaches in Greece. You can enjoy perfect moments here during the summer season, at one of the many coastal resorts found around the coast. During the winter season, the famous ski centre of Agriolefkes provides the perfect destination where you can enjoy ski and winter sports. The landscape and scenery of Pelion is one that you will cherish forever. Each season brings with it new colours and aromas, and the rich natural beauty that the region is famous for is evident from the moment you first arrive. Below you will find information about the current accommodation and hotels that we have available in Pelion and Magnesia in Thessaly, Greece. For more information about the accommodation or hotel, or to check availability and rates, simply click on the corresponding button.